There are only two more rounds left in the Regular Season in IBL. Here is the last round review presented by ESL. An interesting game for Stapac (13-1) which hosted in Jakarta 4th placed Hang Tuah (6-8). First ranked Stapac had an easy win 78-53. Stapac dominated down low during the game scoring 44 of its points in the paint compared to Hang Tuah's 22. They outrebounded Hang Tuah 38-25 including 27 on the defensive glass. Stapac looked well-organized offensively handing out 24 assists. American players dominated the game. Worth to mention a great performance of forward Savon Goodman (198, college: Shaw) who helped to win the game recording 19 points and 9 rebounds (on 8-of-9 shooting from the field). Guard Kendal Yancy (190-94, college: Texas) contributed with 12 points, 7 rebounds and 7 assists for the winners. Forward Jarad Scott (203-95, college: Union, TN) answered with a double-double by scoring 15 points, 12 rebounds and 4 assists for Hang Tuah. The winner was already known earlier in the game, so both coaches allowed to play the bench players saving starting five for next games. Stapac have an impressive series of nine victories in a row. They maintain first place with 13-1 record. Hang Tuah at the other side keeps the fourth position with eight games lost. Stapac's supporters look forward to an exciting derby game next round, where their team will travel locally in Jakarta to the arena NSH. An interesting game for Pelita Jaya (8-4) which hosted in Jakarta 4th placed Pacific Caesar (4-10). Second ranked Pelita Jaya managed to get a 8-point victory 76-68. It was a great evening for American power forward Nate Barfield (206-88, college: Langston) who led his team to a victory with a double-double by scoring 23 points and 15 rebounds. Andakara Dhyaksa helped adding 20 points and 7 rebounds. Pelita Jaya's coach allowed to play the deep bench players saving starting five for next games. At the losing side American forward Qarraan Calhoun (203-86, college: Houston) responded with 25 points and 8 rebounds. The victory was the fourth consecutive win for Pelita Jaya. They maintain second place with 8-4 record behind leader Stapac. Pacific Caesar lost their fourth game in a row. They keep the fourth position with ten games lost. Pelita Jaya will play against Satya Wacana (#5) in Salatiga in the next round. Pacific Caesar will play at home against Siliwangi and it may be a tough game between close rivals. An interesting game for Satria Muda (8-6) which played road game in Bandung against 3rd placed Siliwangi (5-9). Second ranked Satria Muda had an easy win 92-57. It was an exceptional evening for Dior Lowhorn who led the winners with a double-double by scoring 21 points, 14 rebounds and 4 blocks. 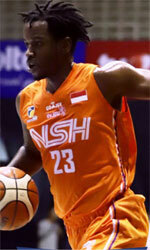 Michael Vigilance came up with a double-double by scoring 15 points and 15 rebounds for Siliwangi in the defeat. Since the result was very predictable, it gave the chance for the coaches to test many bench players which allowed the starters a little rest for the next games. The victory was the fourth consecutive win for Satria Muda. Defending champion maintains second place with 8-6 record behind leader Stapac. Loser Siliwangi keeps the third position with nine games lost. Satria Muda will have a break next round, and it should allow them to practice more before next game. Siliwangi will play against Pacific Caesar in Surabaya and it may be a tough game between close rivals. In the last game of round 19 Satya Wacana was beaten by Prawira on the road 77-69. An interesting game for Stapac (13-1) which hosted in Jakarta 4th placed Hang Tuah (6-8). First ranked Stapac had an easy win 78-53. Stapac dominated down low during the game scoring 44 of its points in the paint compared to Hang Tuah's 22. They outrebounded Hang Tuah 38-25 including 27 on the defensive glass. Stapac looked well-organized offensively handing out 24 assists. American players dominated the game. Worth to mention a great performance of forward Savon Goodman (198, college: Shaw) who helped to win the game recording 19 points and 9 rebounds (on 8-of-9 shooting from the field). Guard Kendal Yancy (190-94, college: Texas) contributed with 12 points, 7 rebounds and 7 assists for the winners. Forward Jarad Scott (203-95, college: Union, TN) answered with a double-double by scoring 15 points, 12 rebounds and 4 assists and guard Bryquis Perine (190-88, college: Green Bay, agency: Promotex) added 12 points in the effort for Hang Tuah. The winner was already known earlier in the game, so both coaches allowed to play the bench players saving starting five for next games. Stapac have an impressive series of nine victories in a row. They maintain first place with 13-1 record. Hang Tuah at the other side keeps the fourth position with eight games lost. Stapac's supporters look forward to an exciting derby game next round, where their team will travel locally in Jakarta to the arena NSH. There was a small surprise when fifth ranked Prawira (4-8) beat their close opponent Satya Wacana (4-11) in Bandung 77-69 on Friday. Prawira looked well-organized offensively handing out 24 assists. American players dominated also this game. It was an exceptional evening for Dalarian Williams (198, college: Life) who led the winners with a double-double by scoring 30 points, 14 rebounds and 4 assists. Guard Brachon Griffin (185-92, college: Elizabeth City, agency: SDJ Sports) accounted for 21 points and 7 assists for the winning side. Forward Raymond Miller (204-88, college: CS Fullerton) came up with a double-double by scoring 19 points and 22 rebounds and guard Madarious Gibbs (185-93, college: Texas Southern) added 21 points, 14 rebounds and 8 assists respectively for Satya Wacana in the defeat. Both coaches used bench players which allowed the starters a little rest for the next games. Prawira maintains fifth place with 4-8 record which they share with defeated Satya Wacana. Satya Wacana lost their third game in a row. They keep the fifth position with 11 games lost. Prawira will meet higher ranked Bima Perkasa (#3) in the next round and it will be quite challenging to get another victory. Satya Wacana will play against the league's second-placed Pelita Jaya and hope to secure a win. An interesting game for Pelita Jaya (8-4) which hosted in Jakarta 4th placed Pacific Caesar (4-10). Second ranked Pelita Jaya managed to get a 8-point victory 76-68. Pelita Jaya dominated down low during the game scoring 42 of its points in the paint compared to Pacific Caesar's 22. They outrebounded Pacific Caesar 48-32 including 17 on the offensive glass. It was a great evening for American power forward Nate Barfield (206-88, college: Langston) who led his team to a victory with a double-double by scoring 23 points and 15 rebounds. The former international point guard Andakara Dhyaksa (173-92) helped adding 20 points and 7 rebounds. Pelita Jaya's coach allowed to play the deep bench players saving starting five for next games. At the losing side American forward Qarraan Calhoun (203-86, college: Houston) responded with 25 points and 8 rebounds and Muhammad Hardian (189-93) scored 17 points, 5 rebounds and 4 assists. The victory was the fourth consecutive win for Pelita Jaya. They maintain second place with 8-4 record behind leader Stapac. Pacific Caesar lost their fourth game in a row. They keep the fourth position with ten games lost. Pelita Jaya will play against Satya Wacana (#5) in Salatiga in the next round. Pacific Caesar will play at home against Siliwangi and it may be a tough game between close rivals. An interesting game for Satria Muda (8-6) which played road game in Bandung against 3rd placed Siliwangi (5-9). Second ranked Satria Muda had an easy win 92-57. Satria Muda outrebounded Siliwangi 46-31 including 31 on the defensive glass. They looked well-organized offensively handing out 28 assists comparing to just 11 passes made by Siliwangi's players. It was an exceptional evening for American forward Dior Lowhorn (201-87, college: USF) who led the winners with a double-double by scoring 21 points, 14 rebounds and 4 blocks. The former international Kevin Sitorus (196-94) accounted for 21 points for the winning side. American forward Michael Vigilance (203-94, college: Clark Atlanta) came up with a double-double by scoring 15 points and 15 rebounds and the other American import point guard Martavious Irving (186-90, college: Kansas St.) added 6 points and 7 assists respectively for Siliwangi in the defeat. Since the result was very predictable, it gave the chance for the coaches to test many bench players which allowed the starters a little rest for the next games. The victory was the fourth consecutive win for Satria Muda. Defending champion maintains second place with 8-6 record behind leader Stapac. Loser Siliwangi keeps the third position with nine games lost. Satria Muda will have a break next round, and it should allow them to practice more before next game. Siliwangi will play against Pacific Caesar in Surabaya and it may be a tough game between close rivals.